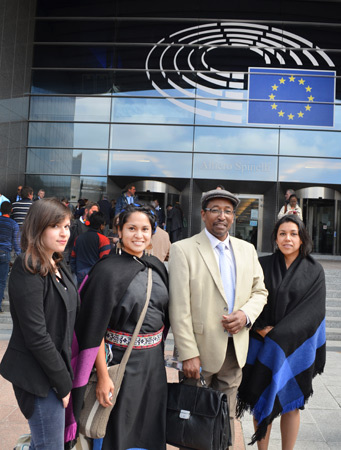 Mapuche: Alina Rodenkirchen at the European Parliament. Mari mari kom pu che, kom pu lamngen, inche ta Alina pingen. Fentren mañum tamü elelmufiel ñi pepi zungual ..ta tüfamew. Tüfachi zungun academic ka científic no tati. Welu may, küpa nentu ngütramün tañi mongelünmew zungu. Chumechi ñi femleken ka ñi pegelünmew ka inche ñi pepi konün afulu. Hello to everybody, Thank you very much to give me to opportunity to speak here. My name is Alina Rodenkirchen. This is not going to be an academic or a scientific presentation. But I would like to share my own experience with you. What I felt and what I saw and of what I was part of. I am going to talk about three demands. In the current situation we have, beside the territorial demand, the demand to respect linguistic rights. Under this we understand the revitalisation of our language, Mapuzungun. In this context some young Mapuche from different groups and organizations joined together to act as a collective. From this union, the idea of the First linguistic residential school of the Mapuzungun language was born. Organized by the Federación Mapuche de Estudiantes (FEMAE), with the collaboration of Academia Nacional del Mapuzugun, Comunidad de Historia Mapuche. I took part as a student in this residential school this February in the community of Llaguepulli, in the lafkenche territory. Some days we were up to 50 persons, Mapuche and Winka together, who were received with a lot of hospitality by the Lonko of this community. We came from all territories. In our diversity , each of us represented one part of the Mapuche history. We travelled from big towns and rural areas to Llaguepulli, but we had one thing in common. We took a first step. We took the time to disconnect from our lives to learn for 3 weeks, to learn Mapuzungun. 3 weeks in the summer is not an easy time to take off for everybody. Some couldn't make it because they had to go to the north of Chile, to work in the fruit plantations, to earn money. They went to harvest fruits that we here consume. These 50 people came together and sacrificed time and left their families, their work, their children to be woken every day in the morning to follow a strict program. But we didn´t just learn Mapuzungun. We got closer to our roots, to our identity. We learned more about ourselves and about our responsibility to take care of the revitalisation of our language. We are now the first or the second generation who can´t speak. Yes, this is a really serious situation. But we can take it as a opportunity. Because we are the generation that has still got the opportunity to change it. Now or never! Because we can learn from and talk to our grandparents or to the older generation. They still have their experience, their knowledge and their wisdom. We can take the initiative and begin to listen to them. On the one hand there is the consciousness, that we have to make the change within our society to make our own future. But on the other hand it is our right and the duty of the Chilean state to recognize us as Mapuche. And this goes hand in hand with the recognition of Mapuzungun as the second official language for example in the Araucanian region. This is one demand of the Mapuche party Wallmapuwen among others. Some years ago they, together with other organizations, began to organize a huge demonstration every year in February on the international day of the mother language. This organisation not only wants to make politics for Mapuche, but for all people living in the Mapuche territory, Wallmapu. They ask for the recognition of a plurinational state. In Wallmapu this means living and creating a future, together with Winka, because everybody is a Wallmapu-che. And everybody should be bilingual. The participants of the residential school took part in this demonstration this year. Now we are waiting for the response of the governor of the Araucanian region, Mr Huenchumilla, to declare the Mapuzungun the second official language of this region. By th way, this should be realized everywhere, where is a large population of indigenous peoples. Our language is in danger. Parents can´t or are not educating their children in Mapuzungun. There must be lessons in school of Mapuzungun. For us, the stay in Llaguepulli brought us a change in our minds and hearts. Before this experience I thought that maybe it´s too difficult to learn Mapuzungun. It even felt strange to listen to other people talking to each other in our language, making jokes, singing or doing hip hop in Mapuzungun. In Llaguepulli we saw children playing in Mapuzungun and switching easily from Winkazungun to Mapuzungun. I began to believe, it is possible. Hearing Mapuzungun all the day long, changed my perception, and maybe that of the others as well. Listening to and making the effort to speak more Mapuzungun has become a part of my daily life now. Already in Chile we got used to speak Mapuzungun in public, buying in the supermarket, asking for something or when we met, we said hello to each other in Mapuzungun. Two weeks ago I found myself in the situation that during a phone call with someone from the Chilean consulate I answered “Feleeey”, which means” I am ok with it” in the Mapuche languge. Even then I was wondering why the person didn´t understand me. The participants of the residential school, their organizations and activists groups continue to work together. On 14 March, a big fire in the national parks China Muerta and Conguilio started and burned down thousands of hectares of native forest and pehuen/ araucaria trees. The participants of the residentia school joined together, organized solidarity concerts, collected water and food for the volunteers in the parks trying to stop the fire. This was a situation when the Chilean government caught all the attention because of their total lack of response as the communities were crying for help and support to save the holy pehuen and to save their houses from the fire. This fire was not a coincidence. In this region large gold and copper deposits were found. For the Pehuenche the Araucaria is a holy tree and it´s prohibited by law to cut them down. Big landowners in this region already tried to cancel this protection years ago. Their intention is to establish more pine and eucalyptus plantations. After the Spanish conquerors, and later the Chilean state, the forestry companies are now the third invasion on Mapuche territory. The damage that these plantations are causing are affecting the whole country. The plantations are destroying the soil and dry out the ground water. One 3 yer old eucalyptus consums 20 litres of water every day. Pesticides are used and sprayed out of helicopters, regardless whether or not they poison people living next to the plantations. A landscape is deforested, the remaining soil is exhausted. The effects are multiple. This year alone, the was an extreme drought. The wells dried out, there was no water for animals , for the crops or for personal use. The harvest was devastating. Our resistance, be it cultural or political, is permanent. We are foreigners in our own land. We are discriminated against when we speak our own language and wear the clothes our grandparents used to wear. But we, the youth, we are not afraid or ashamed anymore. Quite the contrary. We feel glad to know our roots, to know where we come from. And we appreciate the cultural and spiritual richness of our society. We are diverse. No matter where we live, we are Mapuche, we are the survivors. We are the children, we are the grandchildren and the great-grandchildren of those who fought to survive. We give thanks to our ancestors for their fight and we assume our responsibility to continue to fight for our people, for our land, our language, for our society. Joining our strengths we are already designing our future. Designing our future, respecting and listening to the advice and the wisdom of the elders.